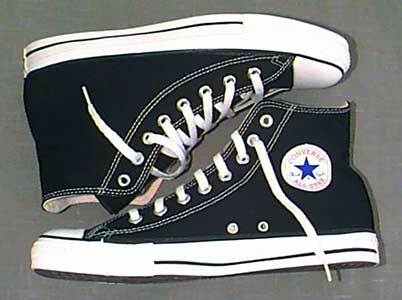 The Converse Chuck Taylor All Star is a great topic for a term paper. Story of how chucks were the premiere basketball shoe for over five decades. Chucks appearance in other sports, weight lifting, skateboarding, even football! Chucks in fashion, how they keep reinventing them in various models and styles. How they have crossed over from casual wear to acceptable wear at work and in fashion shows. How chucks represent so many different types of people. So many styles, models and colors — where do you fit in? Chucks as art — why so many people like to draw on them. Chucks in the media: what kind of characters wear chucks in films and on television shows? Heroes, villains, ordinary people, exceptional people who wear chucks. Chucks in popular music. Why do so many musicians like to wear chucks? You have picked your topic which means it is time to start researching. This can be pretty daunting because with the wealth of information available, it can be hard to figure out where to begin. Luckily, researching is a lot easier than you may think. Break your topic down into sections. For example, if you are writing about chucks in culture, put each cultural aspect into different categories. So you may first look at musicians who wear chucks, then the use of chucks in television and movies, and so on. This helps you to be thorough without missing any important information. Make notes. If you are using books for your research, take some post-it notes and stick them on a particular section that offers some important information. For sources on the internet, print out the articles and highlight the parts you think are most relevant to what you are looking for. Pay special attention to your sources. The internet is a great tool to make research easier, however, while there is plenty of good information, there is also inaccurate information. If you have any doubts about whether or not a piece of information is correct, try cross checking it. If multiple sites and books say something similar to what you have already found, it is probably true. Wikipedia is the infamous site that lets anyone from anywhere put up information on a certain topic. This can be tempting to use because their articles are often a condensed version of everything you think you need. Believe it or not it can actually be useful, though! Not because of the information, but because of the references. Scroll down to the bottom of the page to the references. Most of the time there detailed lists of books that can give one ideas of what to look for in the library. If a website looks “shady” it probably is. You can tell the quality of the site by the quality of the layout. If it looks sloppy and unprofessional, then chances are it is not credible. While there are many sources that should not be used, there are just as many (if not more) that are perfect for your paper. Libraries, databases, and topical lists are all good, readily available options to keep in mind. Then of course, there is the most obvious source: chucksconnection.com is full of just about everything you need to know about chucks! The Converse All Star was introduced to the world in 1917 as a basketball shoe, and has now transcended into the world of fashion. Now that you have done your research, it is now time for you to compile all your newfound knowledge into your final paper. Here a few guidelines to keep in mind to better help you get that A+. DO your own research. DON’T expect someone else to do it for you. DO give yourself enough time to do a good job. DON’T wait until the last minute. After all you are writing about chucks, not just any ordinary sneaker. DO carefully plan out all interviews in advance. DON’T expect someone you don’t know to just stop everything in their lives to answer your questions, especially when most of the answers are probably readily available with a little research. If an interview is a requirement for your paper, look for someone local, a store manager where chucks are sold, a sales representative, or perhaps someone in a band who wears chucks. Make a personal connection. It will meet that requirement quite nicely. DO your own writing. DON’T just copy a bunch of text from the internet. In most schools, plagiarism is a serious offense that can lead to automatic failure and even expulsion. Figure out how to put it in your own words. Talk it over then write it down. If you turn in a paper that uses language that you don’t normally use, it is pretty obvious, and these days, teachers know how to do an Internet search to check on cheating. DON’T use informal language. While it is important to write a paper using your own style, there are still some guidelines that should be followed. Avoid using contractions (it’s, there’s, etc.). Instead, write out the entire word (it is, there is, etc.). Words such as “stuff” and “things” are also seen as sloppy and informal so try to avoid these as much as possible. DO edit your paper. Even the most brilliant of writers have had to go back and make revisions, so make sure you do the same. Pay special attention to grammar and spelling. It is also a good idea to find someone to peer edit your paper in addition to your own editing. DO make sure you get all the information needed to properly cite your sources. There is a difference between copying and pasting and quoting. Using quotes is a great way to support the information in your paper by giving the reader multiple perspectives on the topic. DO use your own experiences as a wearer of chucks to give your paper some perspective. Most likely the reasons you wear chucks are similar to why others wear them. Tip: Check out our Articles and About Chucks pages to get started.